[prMac.com] London, United Kingdom - Elecont LLC today is very excited to announce the release of eWeather HD 3.5, their biggest release of 2015. With dozens of new features the app becomes more than just a beautiful and informative weather app - it is a powerful yet easy-to-use weather station right on your Apple Watch, iPhone and iPad. The app presents its information in an amazingly intuitive format, with a simple, user-friendly interface, gorgeous animations and single-touch access to weather forecast, ranging from a single hour to a year. 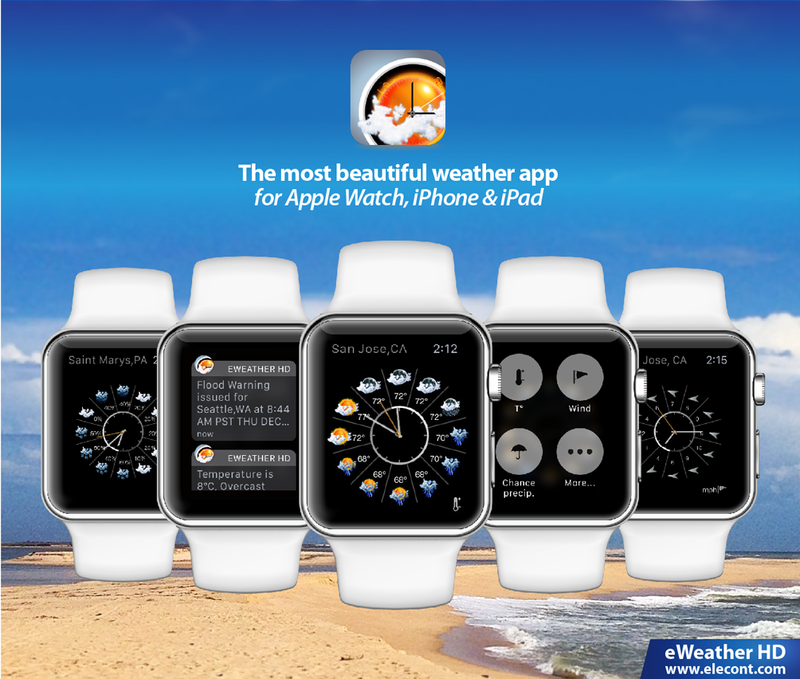 eWeather HD 3.5 introduces new Apple Watch app that provides all important weather data at a glance. eWeather HD for Apple Watch is a full-featured weather app that shows the weather in a beautiful way with its animated graphics. It's designed to look beautiful and work beautifully. eWeather HD for Apple Watch provides the most accurate hour-by-hour weather forecast, temperature of air, sky conditions, "feels like" temperatures, UV index, chance of precipitations, wind speed and direction, geomagnetic activity index, humidity, dew point, instant notifications about severe weather alerts and changes in weather conditions. It also runs natively natively on your Apple Watch, without needing support from the paired iPhone. In addition to new Apple Watch weather app, eWeather 3.5 HD for iPhone and iPad introduces a new feature - Global tide predictions. eWeather HD provides high and low tide times, tide charts, tide tables, current water levels for over 12000 of ports, harbors and coastal locations around the World. eWeather HD automatically accounts for correction factors and provides instant information without requesting that you account for time lags, daylight savings conventions, or height differences between the reference stations and the locations you are seeking. 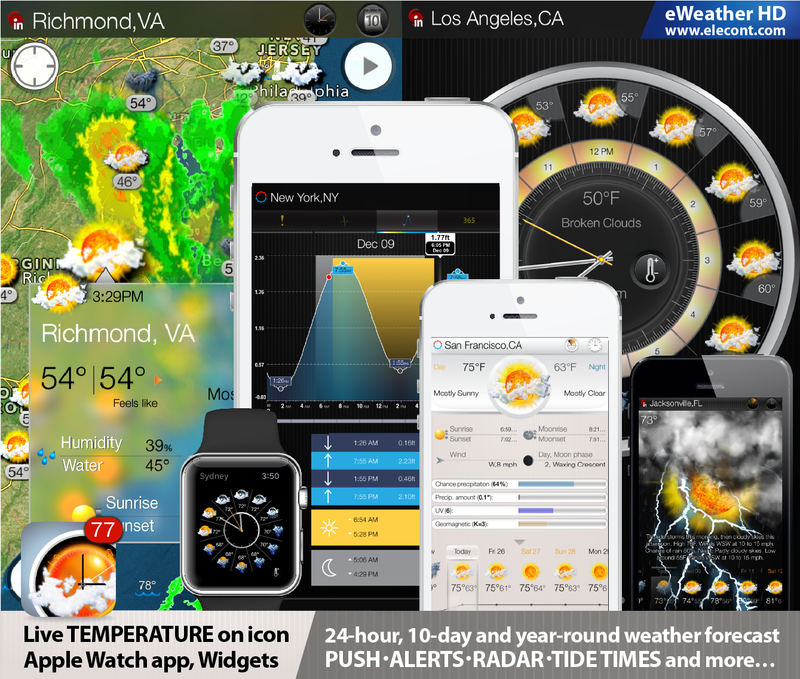 eWeather HD combines all possible weather information packed inside a beautiful user-interface, widgets and Apple Watch. The app provides weather forecast, ranging from a single hour to a year, severe weather alerts for U.S.A. and European countries, high-resolution radar images, unique "weather clock" graphics, animated weather maps, sea surface temperatures, tide predictions, near-realtime data from over 600 NOAA buoys, earthquakes and much more. eWeather HD provides instant access to year-round weather, climate data and sea-surface temperatures. Using original visualization the app provides all important weather-data at a glance - sun, clouds, rain, snow, local weather extremes and records, holiday weather, day/night temperatures, sky conditions, probability of precipitations and temperature of water. It is an indispensable tool for long weather planning, finding a best place and time for vacation, wedding, hiking or other outdoor activity. Winter is a great time to travel. Discover your best beach vacation spots with new eWeather HD. * new Apple Watch weather app that displays the most accurate hour-by-hour weather forecast using gorgeous animated graphics. We're sure you will enjoy using the app and that it will meet all your needs and expectations for weather information. eWeather HD is available in US English, Albanian, Arabic, Armenian, Azerbaijani, Bulgarian, Catalan, Croatian, Czech, Danish, Dutch, Finnish, French, Georgian, German, Greek, Hebrew, Hungarian, Italian, Japanese, Kazakh, Korean, Latvian, Lithuanian, Mongolian, Persian, Polish, Portuguese, Romanian, Russian, Serbian, Simplified Chinese, Slovak, Spanish, Swedish, Thai, Turkish and Ukrainian. eWeather HD 3.5 is offered at an introductory one-time fee of $2.99 USD (or equivalent amount in other currencies) and available worldwide exclusively through the App Store in the Weather category. Elecont LLC is a fast growing software development company specializing in the mobile market, developing software solutions for Android, iOS and Windows Mobile devices. Elecont LLC was founded in 2007 and its primary offices are located in Russia. Copyright (C) 2015 Elecont Software LLC. All Rights Reserved. Apple, the Apple logo, iPhone, iPod and iPad are registered trademarks of Apple Inc. in the U.S. and/or other countries.